Kleinarl is a community in the Pongau region of Salzburg. It has a total population of 850 and is well-known as a destination for skiing holidays. Kleinarl is situated on the edge of the National Park Hohe Tauern and divided into two hamlets (Mitterkleinarl and Hinterkleinarl). As one of Salzburg′s finest skiing towns, Kleinarl′s ski lifts, such as the region of Kleinarl-Flachauwinkel, are members of the Salzburger Sportwelt. The skiing area of Kleinarl is closely tied to the lifts of neighbouring Wagrain and ranges from altitudes between approximately 1,000 and 2,000 metres. The Salzburger Sportwelt seeded the formation of the Ski Amade skiing association, now by some measures the biggest skiing region in Austria. Kleinarl is a member of the Ski Amade. With Annemarie Moser-Pröll, a nationally famous skier from this village, Kleinarl contributed to Austria′s hall of skiing fame. In addition to the vibrant winter season, Kleinarl is working hard on promoting itself as a bi-seasonal destination. Hotels which are sometimes fully booked weeks ahead in good winters face over-capacities during the summer. Therefore, Kleinarl is trying to promote its surroundings for hiking, mountain biking and other Alpine sports. 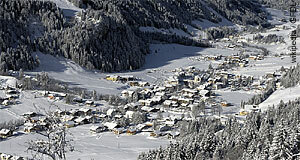 Nevertheless, most money in Kleinarl is made during the time when the village turns into a skiing hotspot. A few years ago, the village reported some 140,000 over-night arrangements that were sold during the winter season, versus 60,000 during the summer. This means that chances for finding a bargain deal are good during the summer - and Kleinarl makes a good base for excursions into the National Park Hohe Tauern. Another selling-point is the relative vicinity to the Gasteinertal Valley with its hot springs and thermal spas.